Very quiet. Nice table to sit outside. Next to a very big supermarket. Short walk from the city center. Good parking space. Had installed mosquito net in the bathroom window so could leave it open. Have your own separate little "house" (grocery store just across the street). Can sit outside and enjoy the breeze and the sounds of the birds and looking at the cats. The grounds make it feel like a little compound away from the town but you can walk to the center in 5 minutes (port 10 tops). Lovely feel. Owner brought us super yummy figs:) Nice to not be stuck in your room. Great location on a great island. 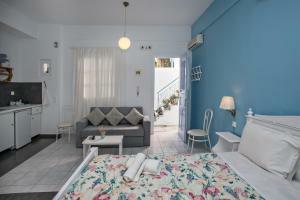 Perfect for escaping the excesses of Mykonos and having a family vacation on the beaches and in the real Greece, Hotel was perfect, quiet and well maintained, five minutes walk from the center of town, and the other way, 10 minutes from the beach. I managed to lose my camera and George made a series of phone calls around Tinos to help me find it again. Thanks George. We loved your place! The staff was very friendly. They also treat us a sweet to welcome us. The place is ideal to relax. Not far away from the center of the town, about 5 mins walking. In 50m distance there is a super market to buy things. We had a motor bike and we could park it inside and not on the street. Great also for families and pets. We had an amazing experience there for a multiplicity of reasons. The most important being, if you are looking for a vacation away from the usual hustle of the hotels/hostels and prefer to be in a piece of nature in a bungalow with your kitchen, this is the perfect place. On top of this, the owner/staff are very warm and sincere which during our stay we enjoyed their company. They made us truly felt like their guests. Only stayed one night but comfortable. The owner was very helpful. Wonderful property with lots of trees and flowers - a peaceful oasis! The apartment was very comfortable and had everything we needed. The staff were very friendly and both picked us up and dropped us off at the ferry. I was met at the ferry terminal with a driver who took me to the property. He was friendly, helpful and efficient. The hotel grounds had a beautiful garden and sitting areas. The owner/manager spoke English and was polite and explained the room correctly. The hotel was right across the street from the supermarket and 3-5 minutes to the port/water. The room was basic, clean....had a great balcony/patio. It was great for the money. Location is ok. No view or sea breeze but it is not that far from the port and the beach. It has a nice garden with a lot of trees and flowers. 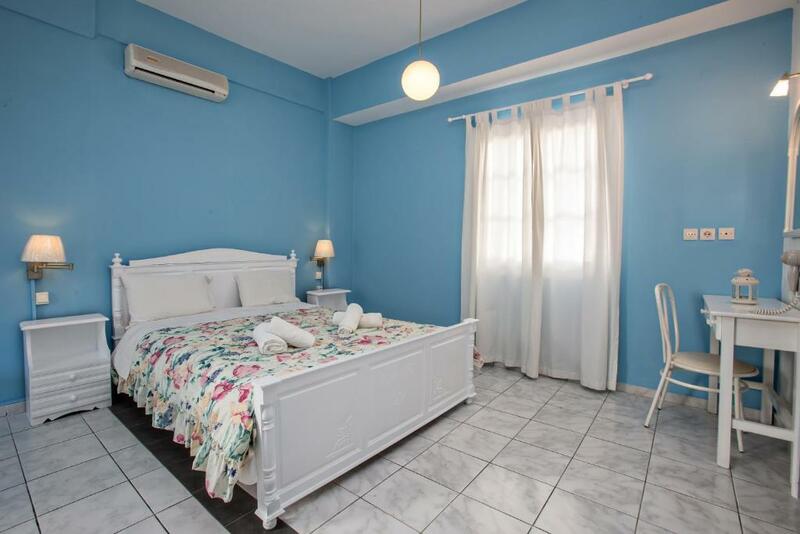 The rooms are nicely decorated and the bed is confortable. Across the accomodation is a big supermarket witch is handy if you want to cook your own breakfast or meal. Lock in a great price for Prasino Oniro – rated 8.2 by recent guests! 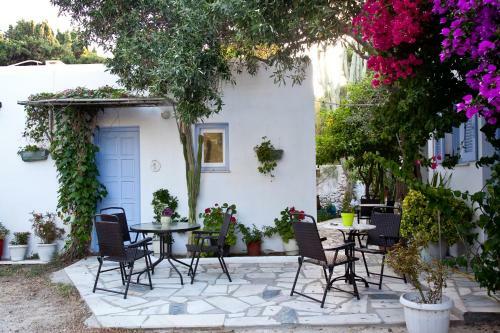 Set amid a 6,000-m² garden with trees and colorful flowers, Prasino Oniro is located in Tinos Town. It offers air-conditioned rooms with free WiFi access. Agios Fokas Beach lies within 1,000 feet. 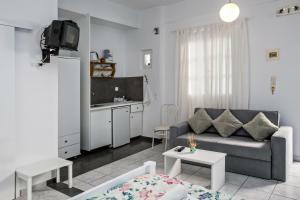 Bright and airy, all rooms at Prasino Oniro include a TV, stovetop, coffee maker and a fridge. 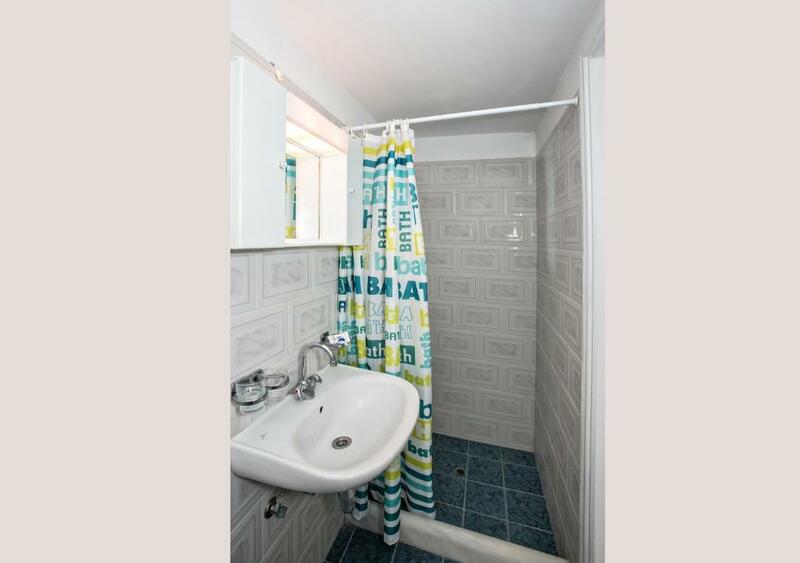 Featuring a shower, the private bathroom also comes with a hairdryer. Each opens to a furnished patio. 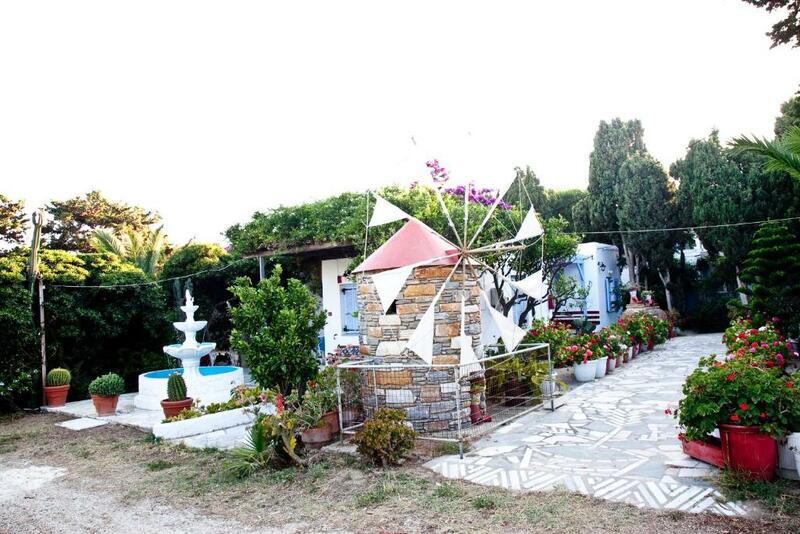 At Prasino Oniro you will find a blossomed garden featuring a small lake with ducks, and barbecue facilities. Other facilities offered at the property include a children's playground. Tinos Port is 1,150 feet away and Agios Sostis Beach is located 3.1 mi away. A supermarket can be found at a distance of 350 feet and a bakery at 150 feet. Panormos village is at a distance of 15 mi. Free private parking is provided on site. 뀐 Located in the top-rated area in Tinos, this property has an excellent location score of 8.6! 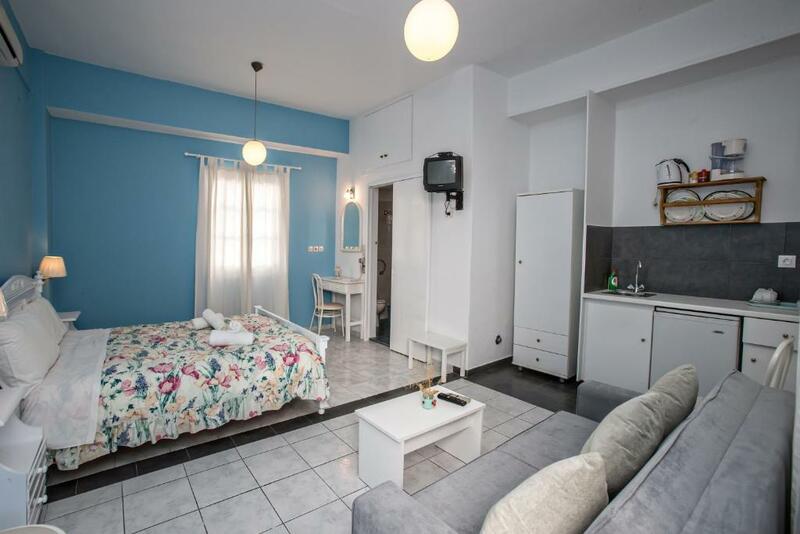 When would you like to stay at Prasino Oniro? Τhis air-conditioned room includes a TV, stovetop, coffee maker and a fridge. 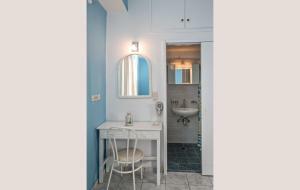 Featuring a shower, the private bathroom also comes with a hairdryer. Free WiFi is available. PRASINO ONIRO WAS PRASINO ONIRO WAS FIRST CREATED IN 1982.IN THE NINETEES AND AFTER 2003 WE ADDED SEVERAL ROOMS TO THOSE EXISTING AT THE TIME OF ITS CREATION,,ACCORDING TOTHE RULES OF THE GREEK ORGANISATION OF GREECE.SINCE 2 YEARS WE STARTED WORKING ONLY WITH THE ROOMS AND BUNGALOWS.,WE HAVE THE APPELATION "FURNISHED ROOMS AND APPARTEMENTS,.CLASSED 3 KEYS. WEPROCEED THIS YEAR INTHE CREATION OF 2ROOMS AD AN APPARTEMENT FROM 6 SMALLER ROOMS OF TWO PEOPLE EACH ,CREATING TWO ROOMS FOR 4PEOPLE EACH ,AND AN APPARTEMENT FOR 4 ,SO WE SOLVEDTHE PROBLEM OF SIZE,BY BUILDING UP ROOMS WITH MORE SPACE .THE ARE AIS 6000 METRES SQUARE EXTENT, ALL PLANTED WITH CYPPRESSES ,LEMO N TREES,OLIVE TREES,PINS, PISTACHION TREES,WITH A LOT OF PLANTS WICH HAVE FLOWERS. LIKE BOUGAINVILEAS,OLEANDERS,GERANIUMS IBISCUS,ETC. A LOT OF ANIMALS LIVE IN THE AREA THAT I WI LL MENTION BELOW. I WAS BORN IN TINOS IN 1960 WHERE HAVE STUDIED IN PRIMARY AND MIDDLE SCHOOL.I L LIVED IN PARIS TWO YEARS FROM 18 TO 20.I HAVE STUDIED FRENCH IN THE FRENCH INSITUTE OF ATHENS WHERE I OBTAINED THE DEGREE "SORBONNE 3,"WITH MENTION "ASSEZ BIEN". MY MAIN STUDIES WERE IN JOURNALISM WHICH I HAVE STUDIED IN A PRIVATE SCHOOL IN ATHENS "'THE LEVEL OF STUDIES WAS HIGH .AND IT HAS INTERESTED ME MUCH ALTHOUG I DID NOT WORK AS A JOURNALIS.I I PREFERED TO COME TOTINOS,WERE I COULD TAKE TO MY HOBBIES I LIKE THE QUIETNESS AND THE PEACE OF TINOS COUNTRY,SO I LIKE TO GO FOR A WALK IN MY FAVOURITE SITES. I DONT GET BORED GOING TO THE SAME PLACE. MY WALKS ARE LIKE A PILGRIMAGE:THIS IS THE PLACE WHERE I USED TOGO WITH MY PARENTS FOR SUMMER HOLLYDAYS,THAT IS THE SMALL,FAMILY CHURCH AT PRIASTRO WHERE WE WOULD CELEBRATE THE CROSS EXALTATION, ON THE 14 OF SEPTEMBER. I USED TO GO WITH MY FAMILLY ON DONKEYS TO SPEND THE NIHGT BEFORE THE CELEBRATION, IN A FARMERS COTTAGE... MANY MEMORIES EVERYWHERE FROM CHILDHOOD .LOVE GARDENING AND BREEDING BIRDS,I SPEAK FRENCH,ENGLISH,ITALIAN RUSSIAN GERMAN. MY DEVISE::MONEY CANT BUY THE MOST EXPENSIVE THINGS..I AM AN ORTHODOX CHRISTIAN . House Rules Prasino Oniro takes special requests – add in the next step! Prasino Oniro accepts these cards and reserves the right to temporarily hold an amount prior to arrival. Please note that pets are allowed on request. Please note that the property does not have a 24-hour reception. Please inform Prasino Oniro of your expected arrival time in advance. You can use the Special Requests box when booking, or contact the property directly using the contact details in your confirmation. Furniture was a bit dated. Hobs were not in a good state, quite rusty. Coffee maker had an old filter with coffee still in which was covered in mold (left it and it stayed there throughout the stay). I think the cost and the hotel met my expectations. I suppose a kitchen towel (to dry dishes) would be nice but no big deal. The problem was that the stuff or the neighbours (from the other accomodations accross the street) might wake you up early in the morning with their voices. I recomend it to older couples. The guy pic up us at station and did show easy ways to get anything that we were to need. It is located in a former farmhouse, with one-storey houses spread across the property. We liked the ambience, with peacocks, a nice small windmill. The beach is close by. Although a bit away from the center, but it is only ten minutes walk from the old port.